KUCHING: A new bridge linking up Matang and Stapok here is now completed. Works Minister Datuk Seri Fadillah Yusof said the connecting road is into its final stages of completion and hoped the new facility would be open to the public by early April. “The bridge has been fully completed and now the connecting road is at its final details. “If everything goes according to plan, we shall be able to complete the project by March and hopefully open to public by April,” he told reporters after a site inspection yesterday. Fadillah, who is Petra Jaya MP, said he was told that vandalism had taken place at the project site. According to him, an expansion joint of the bridge was stolen before and the contractor had to replace it. “Expansion joint is a critical part of the bridge and there are risks if it is vandalised or stolen. “We hope such vandalism or theft will stop happening so that there is no more delay on this project,” he said. He also called upon members of the public in the area to cooperate with the authorities rather than causing inconvenience to all. “When items are vandalised or stolen, the work may not be able to go on as planned. Fadillah said the state government is in the midst of bidding for RM90 million to build the ‘missing links’ at Jalan Datuk Temenggong Tan Meng Chong and Jalan Stapok Utama. He said the project cost was high due to the higher land value in the area. “Not only is the land in the area high in value but some parts of it are also soft, a condition which calls for more foundation work,” he added. On the Datuk Abang Kipali Abang Akip roundabout underpass project, Fadillah said it was slightly behind schedule due to poor weather. He said the project scope involved a lot of underground job but too much water as a result of bad weather had caused some delay. “It was supposed to be completed by February. And hopefully we can get the project done by April, followed by safety audit,” he said. 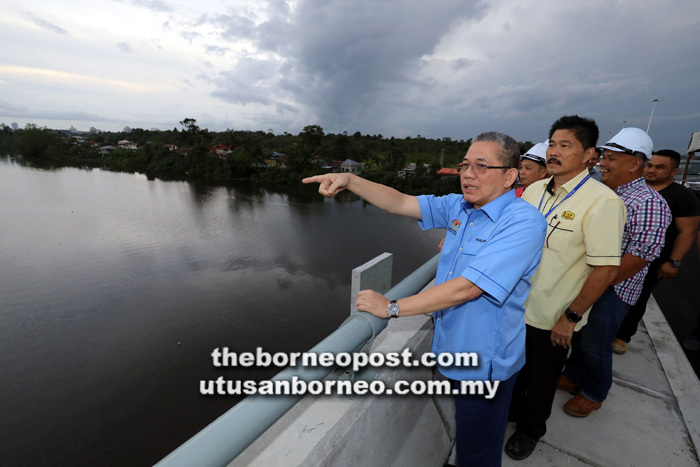 Touching on another project, he said the Batang Samarahan Bridge project had reached its final stage and was expected to be completed by May. “The entire project including its connecting road should be completed by May,” he added. Accompanying him on the site visit was state Public Works Department head of projects Vincent Tang.